BCC card cage systems can be constructed as 4-slot, 8-slot, or dual 8-slot 19" rack units. Various power supply options allow the BCC system to go virtually anywhere. 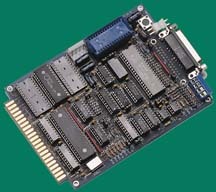 The BCC30A 12-bit-plus-sign analog-to-digital converter board is a 16 channel high-speed unit designed for use with all BCC-bus computer/designed for use with all BCC-bus computer/controllers. 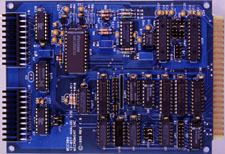 The BCC30A monitors up to 16 single-ended (or 8 differential) signals in a bipolar range of –5 to +5V or 16 single-ended signals in a unipolar range of 0 to +5 V. The BCC30A A/D converter board is easily accessible from BASIC, Forth, or assembly language and multiple boards can be used in a single system. Channels are individually addressable and can be converted at up to 20,000 samples per second. 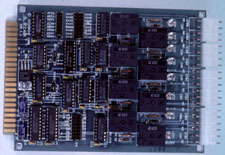 The high-speed ADC is unique in that its 16 channels (8 channels differential) have individually programmable input gains. 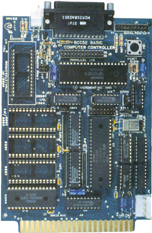 Using gain multiplication on low-level signals provides the performance of a 16-bit ADC at a 12-bit price. The BCC30A also has 4 channels of high-performance, wide-range-output DAC. Using efficient mechanical relays, the BCC40R provides contact-closure on/off control of eight AC-or DC-powered devices for data acquisition and control applications. The relays are controlled by writing to a board-specific I/O address and can be controlled either as a set of eight relays at a single I/O address or individual relays at eight separate I/O addresses. Four of the relays have single-pole, double-throw (SPDT) output connections and four relays have single-pole, single-throw (SPST) output connections.